Enter the Capital One Simply Smarter Home Sweepstakes by August 21st and you could win the ultimate smart home system, fully installed with a lighting control kit, cameras, thermostat, smoke alarm, speaker and smart assistant. 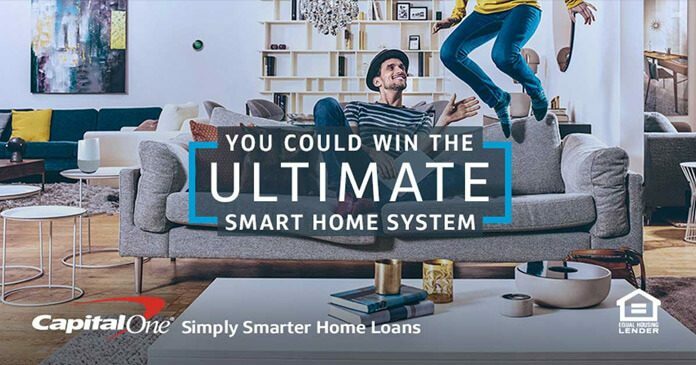 Go to SimplySmarterSweepstakes.com, take the Simply Smarter Homebuying Quiz then, register for a chance to win the grand prize valued at over $2,500. Enter your email address and click “Enter”. Input your first name, last name, and zip code then, click “Enter and Take Quiz”. Complete the Simply Smarter Homebuying Quiz as directed onscreen. Once complete, you will receive one entry into the Sweepstakes. You do not have to take the quiz to gain an entry into the Sweepstakes. If you take the quiz, you will receive a Sweepstakes entry regardless of whether you answer the questions correctly. Additionally, you may obtain additional entries by following the instructions on the Website to share the Sweepstakes on Facebook and Twitter. Every time a friend registers through your shared post or tweet, you’ll get another chance to win (up to five additional entries). help cover installation costs). The ARV of each Grand Prize is $2,785. The first prize is one (1) Google Home. The ARV of each First Prize is $129. The total ARV of all available prizes in the Sweepstakes is $18,258. Want to know more about the Capital One Simply Smarter Home Sweepstakes? Check out the details below. The Sweepstakes is offered only to legal residents of the 50 United States and the District of Columbia who are at least 18 years of age at the time of entry. The Sweepstakes begins on July 10, 2017 at 12:00 PM ET, ends on August 21, 2017 at 11:59:59 PM ET, and consists of 6 entry periods as outlined below. Start at 12:00:00 a.m. ET on July 10, 2017 and ends at 11:59:00 p.m. ET on July 16, 2017. Start at 12:00:00 a.m. ET on July 17, 2017 and ends at 11:59:00 p.m. ET on July 23, 2017. Start at 12:00:00 a.m. ET on July 24, 2017 and ends at 11:59:00 p.m. ET on July 30, 2017. Start at 12:00:00 a.m. ET on July 31, 2017 and ends at 11:59:00 p.m. ET on August 6, 2017. Start at 12:00:00 a.m. ET on August 7, 2017 and ends at 11:59:00 p.m. ET on August 13, 2017. Start at 12:00:00 a.m. ET on August 14, 2017 and ends at 11:59:00 p.m. ET on August 21, 2017. Limit one total entry per eligible entrant per calendar day during the Sweepstakes Period. On or about each Drawing Date, the Administrator will randomly select one potential grand prize winner and 2 potential first prize winners from all eligible entries received in the applicable Entry Period. For a list of winners, an interested individual should mail a self-addressed stamped business envelope to: Winners List, Capital One Simply Smarter Home Sweepstakes, PO Box 251328, West Bloomfield, MI 48325. Winner List requests must be received no later than October 21, 2017. The Sweepstakes is sponsored by Capital One, N.A., 1680 Capital One Drive, McLean, VA 22102 and is being administrated by Prize Logic, LLC, 25200 Telegraph Road, Suite 405, Southfield, MI 48033. For complete details about this Capital One Sweepstakes, please read the official rules.